Pedion: Urban Battlefields Kickstarter closing with beautiful Unlocks! Urban Battlefields Kickstarter closing with beautiful Unlocks! Didn't you always wished for a Harbour in your City? We just unlocked them! Only a few days are left before our Urban Tiles Kickstarter ends - so this is your last chance to join, and claim some of the most extraordinary urban terrain you will ever see! 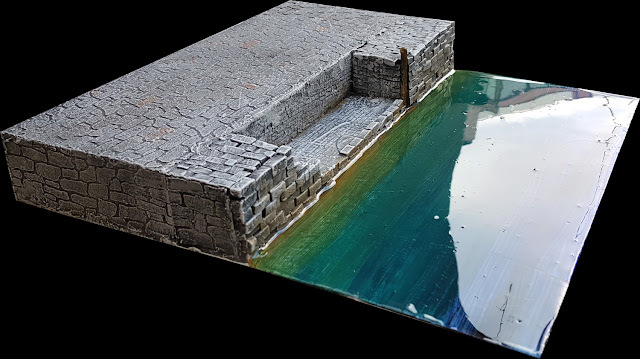 The Kickstarter Urban Terrain Campaign has unlocked a series of new designs as Stretch Goals,all even more innovative and good-looking. 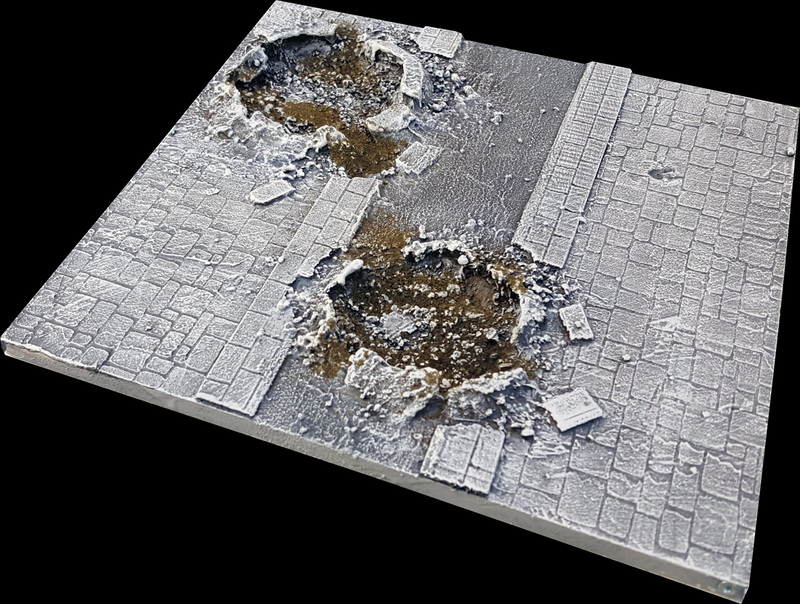 We want to show you some prototype pictures of these new urban tiles, so you can judge for yourself. I'll start with the most impressive unlock, the ability to recreate a city harbour. The Stretch Goal actually unlocked two (2) specific Harbour Tile designs. Both represent linear harbour pieces: the first is a regular Pier and the other a "Stepped" Pier. They are raised pieces, the "urban" side of the tile at a full height of 4cm. The dock side occupies half the tile, and midway (at 15cm) it drops to water level (1mm). Since our regular urban tile's height is at 1cm, there is a 3cm height difference meant to emphasise the vertical docks. You can "join" the harbour tiles with your regular tiles just by adding some of our resin stairs. However, more raised tiles and/or sloped roads (by making use of the Urban Elevation System) will produce more interesting layouts. Harbour tiles can be joined in a row to form a full harbour. 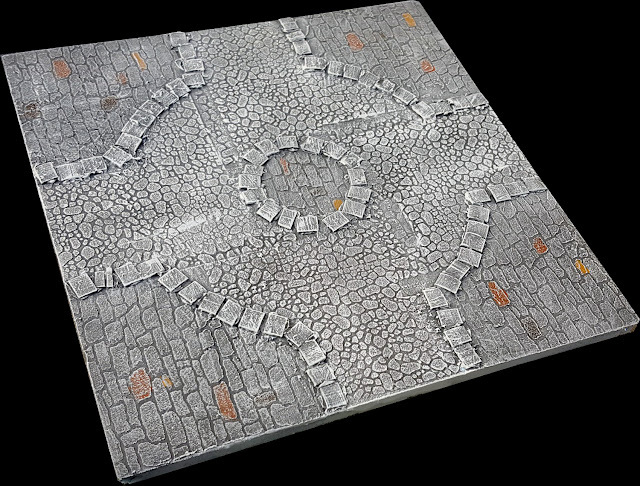 The second Stretch Goal is a new Tile Design, and a beautiful one at that. You can now choose the Roundabout design for your extra tiles, instead of a more conventional "X"-intersection. This unlock does not offer you a new tile design per se, but lets you alter the appearance of any (or all) of the tiles you have selected. After the campaign Backers will specify for each tile (or number of tiles in the reward set) whether they want them to "suffer" from battle damage and explosions! The tile will "acquire" 2 different sized artillery craters and debris. And there are even more Stretch Goals unlocked, too many to detail here: parking lot tiles, open ground tiles, and -most complex of them all- a full City Canal system! What are you waiting for? you have only hours left! Join us!